If you're a U.S.-based poker player, then you may have seen or heard of Jao Poker, an entity that has seemingly sprung up overnight and promises fully legal online poker for Americans. Unfortunately, once you look beyond the hype, the entire operation appears questionable at best. We have reviewed Jao Poker and believe it to be a shady company that ultimately won't be able to fulfill its obligations to players or affiliates. Read our review of Jao Poker below. Most internet poker rooms are happy to partner with affiliates who can promote their games, and they allow anyone to become an affiliate for free. Affiliate programs are free because they only pay based on performance. In other words, if an affiliate fails to send players, the affiliate program has no need to pay said affiliate as it has incurred no costs. Jao Poker, on the other hand, uses its affiliates as a source of income. Jao Poker charges $250 for an affiliate account! Whoever does pay this fee gets a $100 credit to their poker balance along with Jao-branded merchandise, but the total value delivered is much less than the $250 upfront cost. In order to recoup their investments, affiliates must try to sign up enough players so that their share of the rake is sufficient to make a profit. The compensation scheme is complicated and involves Jao Poker rakeback on an individual's own play, the amount of rake referred players generate, and bonuses for signing up other affiliates. Downstream credit extends for 10 levels, encouraging people to bring other affiliates aboard who then convince others to join, and so on until the whole structure resembles a pyramid. This sounds a lot like a sketchy MLM scam doesn't it? All tiers of this affiliate program are trying to make enough money to pay off their $250 initial cost, and it's hard to see how Jao will be able to host enough traffic to make this possible for a very long time if ever. Jao doesn't allow anyone to register as a player unless they use an affiliate code. This is one way to try to ensure that affiliates receive credit for their referrals, but it also has the effect of limiting traffic. This tactic seems ultimately counterproductive especially because player liquidity is pretty small at the moment. Jao Poker is now running a promo allowing people to become affiliates, or “Independent Business Owners” (IBOs) as Jao calls them, for just $100. Maybe the $250 price tag was too high to achieve the participation levels Jao was hoping for? This special is running until Labor Day (Sept. 4). However, those who accept this deal only get $50 placed into their player accounts rather than the standard $100, and they don't get any Jao merchandise either. Even at the reduced price point, this “offer” leaves much to be desired. Editor's Note: We've found evidence that despite the high hopes Jao is placing on this affiliate model, player participation has been insufficient. On a Serbian-language poker forum, we saw a request, dated Oct. 23, 2017, for “props“ to boost the site's flagging poker traffic. A prop is a player who's paid by the house to start games and keep them running. There's nothing intrinsically wrong with propping programs - many newer sites use them to boost their popularity while they're still getting started. However, Jao is doing a few strange things here. For starters, they're paying props a set wage by the hour whereas most such systems reward props with a percentage of rakeback. The amount they're willing to pay is pretty small too: between $3.50 and $4.50 per hour. Secondly, Jao is only looking for 10 people to participate in this deal. It's tough to see how only 10 people could make very much of a difference though. It may be that poker room managers are getting desperate and willing to try anything, no matter how off-the-wall, in order to grow their site. Fortunately, forumite “Elendil0“ posted a link to this very page in the forum to warn others away from this dubious opportunity. Jao management and affiliates are heading to internet forums and social media to shill the site. There are multiple Facebook groups that have been reporting an infestation of Jao Poker fanboys posting their aff codes, often against the rules of the group. Some of them are even developing personal FB pages that are basically advertisements for the site complete with large banners and signup codes. When you accept one of them as a friend, then others will soon send you a request, and you could wind up with dozens of “friends” who are just trying to promote this increasingly desperate-looking organization. Mr. Nguyen aired his beef with a customer in a public arena rather than settling the matter privately. The language he used and the allegations he made come off as very unprofessional regardless of the merits of his claims. It's probably also a violation of privacy terms, and if it isn't, it should be. We've seen Tam Nguyen spreading his affiliate code just about everywhere, including Facebook, Twitter, YouTube and a variety of other online venues. An unnamed Jao insider informed us that Tam has more than 1,000 signups under his code, earning him thousands of dollars per month. It's no wonder he's so vigorous in trying to protect the reputation of his gravy train. Editor's Note: Since the publication of this article, Tam Nguyen has been disputing the information we've presented. 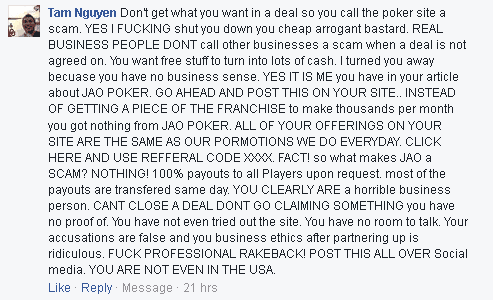 He has made comments to this effect on Professional Rakeback's Facebook page. You can view his post below and gauge the sobriety and rationality of his statements for yourself. Jao Poker used to support PayPal for deposits and withdrawals, allegedly making it easier for U.S. players to move their money around. This wasn't really a point in its favor though because PayPal prohibits its customers in the United States from using its services for online gambling purposes. Not only can Jao get in trouble as a merchant, but ordinary players may see their PayPal accounts suspended or frozen if they have conducted any transactions related to gambling. In order to get around the rules, Jao sent and received money to separate accounts under different names in direct violation of the UIGEA (the DOJ will get fired up over this)! This jig appears to be up as Jao no longer lists PayPal as a method for either placing money into poker accounts or cashing it out. It instead transacts now in credit cards, bank transfers, and other payment processors. We've received word that Jao is transitioning to doing business exclusively in Bitcoin. This isn't anything really special either; there are many internet poker sites that support this cryptocurrency. 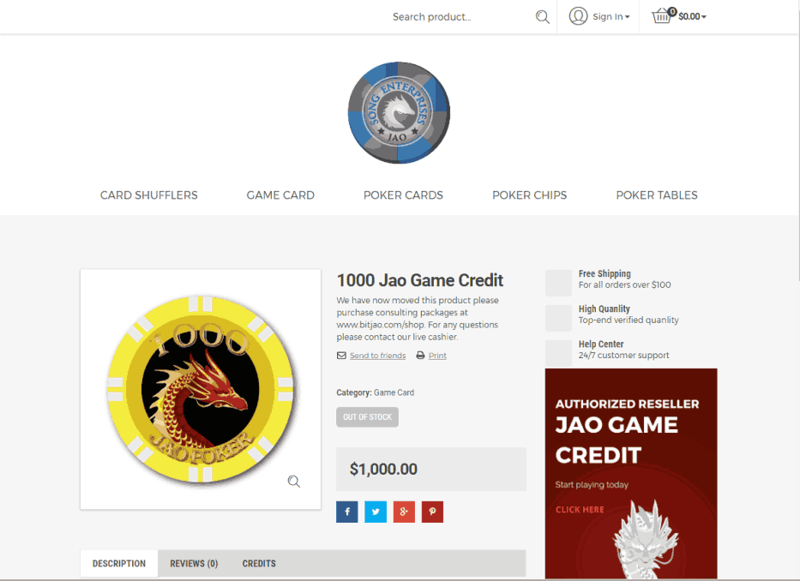 Jao Poker is just catching up to the USA industry standard in this area. Editor's Note: More details have emerged as to Jao Poker's payment processing efforts. They're acutally setting up fake e-commerce sites to allow users to make deposits with their Visa and MasterCard credit cards while circumventing the controls that card issuers have put in place. Songenterprises.com is one of these fake storefronts, which has been saved for posterity on InternetArchive.org. 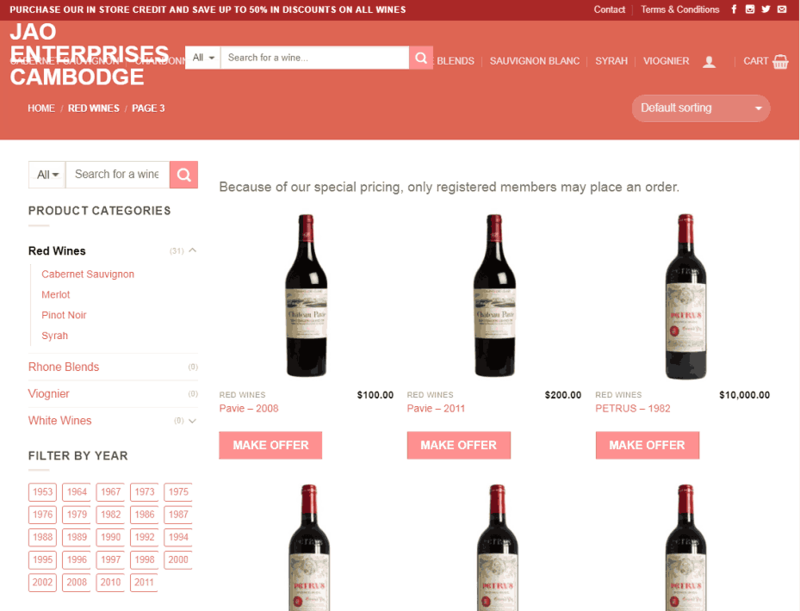 Website of “Song Enterprises" - along with card shufflers, poker chips, and other seemingly legitimate merchandise is this "1000 Jao Game Credit"
Another bogus e-store, "Jao Enterprises" - notice how the prices of the bottles of wine are all suspiciously round and even numbers. Click a Mouse, Lose a House? This isn't the first we've heard of the housing scandal either. Not only did a source brief us on the subject privately, but other forums are talking about it as well. A trusted source contacted us about the housing fraud subject and confirmed the story as true. Even after such a short time in the online poker industy, Jao has managed to annoy many people in small but irritating ways. In a thread on twoplustwo.com, many forumites are sharing their negative experiences. One was told that a points store would open by July 1, but there's so sign of any such store yet. Another person sent an email asking what documentation is required before requesting a withdrawal, and support answered telling him what email address to send cashout requests to. Someone else reported having trouble making a credit card deposit.The software is poor, and there are frequent reports of software timeouts. The website design is also lacking with occassional graphical layout mishaps. While each one of these user concerns is minor, the fact that there are so many of them calls into questions the overall competence of the personnel at Jao Poker. Jao Poker states that it's licensed and regulated in the Kingdom of Cambodia, which is the first time we've ever heard of any online real money gaming entity being licensed in that country. There's no mention of the random number generator or the poker software on the website. There is a FAQ, but it only contains very basic questions and answers without much relating to the poker games, cashier methods, account verification procedures, promotions, or the other topics that you would expect to find in such a document. Anyone looking for solid information on Jao Poker will likely come up short. There are allegations being made in some quarters that people are cheating by sharing hole cards in outside chatrooms, and Jao has been unwilling or unable to stop it. If true, this means that anyone who's not in on the deception is getting fleeced bigtime. Editor's Note: Start ups (if you can call Jao that) often devote few resources to fraud prevention simply due to the costs of implementing the personnel. It would not surprise us if Jao Poker skipped this step entirely. While conducting research for this article, we here at Professional Rakeback stumbled upon something that made our blood boil. When we reviewed this text explaining Jao's affiliate compensation model, entire paragraphs are lifted from ProfRB's page about online poker in Minnesota article! Needless to say, Jao neither asked for nor received permission to copy these passages from us. In fact, they probably did it out of spite. You see, we have blocked them from certain online forums and social media groups for incessant spamming. Thus, when they realized they had no hope of advertising with Professional Rakeback, they decided to pilfer through our content and steal what they could for themselves (might they exhibit the same behavior and claim your account balance as their own one day?) This is just another indication that the executives at Jao are lazy and unoriginal at best and downright unscrupulous thieves at worst. Editor's Note: We update our articles frequently, and so the Minnesota page linked above no longer contains the portion that Jao Poker stole from us. You can view an old copy of the page from April 27, 2017 courtesy of Internet Archive that clearly shows the lifted text. Whether you are a player or an aspiring affiliate, there are other options. You would earn more money, more safely, whether grinding the felt or putting your marketing talents to work at other poker sites and programs. Professional Rakeback has taken the liberty of providing some alternative choices below. The numerous issues with Jao Poker make it an unwise poker destination for anyone who values his or her hard-earned money. Fortunately, there are plenty of reputable offshore poker sites that welcome Americans to the tables. They have strong histories of dealing games fairly and of paying out winnings without hassles. To learn more about the top places to play cards, check out our guides to the best US online poker sites, Australian poker sites, and more by browsing this website. You do not need to pay to join an affiliate program or become an independent business owner in the online gambling industry. These relationships are free at every reputable program. Why are they free? Because everyone is paid based on performance in this industry. If a new affiliate fails to deliver customers to an affiliate program, they do not get paid. Attempting to monetize an affiliate program by demanding up front money to join is a sign of a poorly designed program. It is also a sign of a multi-level-marketing scheme looking to bilk its uninformed "investors" out of as much money as possible. A successful affiliate can earn 20-45% commissions at reputable affiliate programs, with no up front fees, access to free support, free marketing materials, as well as provide their customers with better user experience and improved safety. Below are links to some of our favorite affiliate programs where you can further educate yourself on alternatives to joining up with a shady outfit such as Jao Poker. Up to 35% commissions on sports, casino, and poker referrals. Conversion rates to real money play are some of the best in the industry. Affiliate commissions are paid via wire, bitcoin, or player account deposit, within 2-3 weeks, for the prior month's earnings. Visit the Commission.bz affiliate program. Up to 35% commissions on sports, casino, and poker referrals. Your players will earn 36% rakeback paid daily. Affiliate payments are monthly, direct to player account, and paid within the first 3 days of the following month. Visit Intertops affiliate website. WPN Affiliates - America's Cardroom, Black Chip, Ya! Up to 35% commissions on VIP players and 12% commissions on rakeback players. Your rakeback players earn 27% rakeback paid on demand. They pay commissions monthly, typically 20 days after the prior month's end, directly to your player account where you can withdraw via bitcoin or other crypto-currencies. Visit the WPN Affiliates program website. If you are serious about becoming an online gambling affiliate and have a unique or interesting idea to recruit players, feel free to contact Professional Rakeback directly via the "Contact Us" link at the bottom of every page. We would be happy to listen to your ideas, offer advice, and help guide you via a sub-affiliate relationship. Permalink Submitted by PRB Responds on Thu, 10/26/2017 - 16:25. I've seen a couple of articles and shady marketing already. I actually requested a payout from them and they never responded as well. I'm not a fan, and I don't promote them. I actually posted this before I requested my payout. Here's the link to the thread so you can see for yourself. And this is the problem with multi-level-marketing in action. A new IBO jumps onto this site excited by the marketing pitch he has received. He has to pay for the privilege of joining, and then, in order to recoup his funds, rushes out and pushes the product to other players without any real testing or vetting of the product in question. It is a poor business model for almost any industry and it will not work in the gambling industry. Professional Rakeback still highly recommends avoiding this network and we will keep this page updated as new information arrives. Permalink Submitted by Doesnt Matter (not verified) on Sat, 12/02/2017 - 14:18. PRETTY SURE THE ONLY PLAYERS ON THAT SITE ARE THEIR AFFILIATES AND I'M PRETTY SURE THEY CAN SEE YOUR HOLE CARDS. SHADY PLAYS..
Permalink Submitted by lvkdamspoijfe (not verified) on Mon, 02/19/2018 - 14:16. I requested a $1500 withdrawal weeks ago and have not heard back from them and now the money in my account is gone. They said it would be processed within 3 days. Permalink Submitted by PRB Responds on Mon, 02/19/2018 - 15:20. What method of withdrawal did you choose? Which ones did they offer you? What method of communication did you have with them? Can you provide screenshots? If so, email us or hit us up on Skype.